very good demo, well-designed and solid! special thanks for shaded squares and epilogue. it rocked! Very good demo from Gemba Boys! Very entertaining. How is DiHalt logo done? Very nice, finally some effects. I like the polygon fillers. Great stuff, watched it on my +2 today, top visuals and msx. I like the abuse of yellow :) the rotating star and the logo at the end. I like the smooth nature of this demo, how the ocean waves at the background almost never stop and how the oldschool effects are given new meanings by re-thinking them in the context of the chosen concept. Low key, but high on design, pacing, transitions and overall sense of style. Great demo with good effects and design. Nice demo with cool effects! I enjoyed it alot! Especially, logo at the end. Really nice production, like the idea. The filled vectors part are just superb! 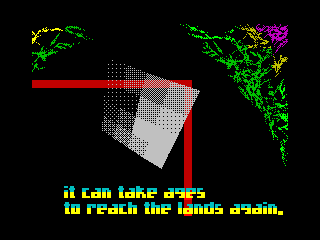 Great music and nice graphics..Only one point - a little bit to repetitive. And perhaps - the charsets - could have been more, how to say... "underwater'ish". But that's only a detail. Anyway - Congratulations dudes. Keep it up!! Excellent end logo! Very nice! Thumb up for realtime 3D effects! A bit repetitive, but what's there is nice. neat and simple. endpart is really cool. should've won, way better design & fx than in the fancy hardware demos. still cliche fx here, last screen is the best. Amazing demo, underwater style and some nice effects makes it great. Sweet design, music and atmosphere! page created in 0.017894 seconds with 15 queries.